There's a great line by Nabokov in which he says that people who are born elsewhere and do not have English as their first language are most likely to have a great appreciation of the language and be able to write well in it. And there are a number of, of examples that he gives, and I don't want to put myself in the same category as Nabokov in any sense, but at the same time, that notion appeals to me, because I was born to a family of completely unassimilated immigrants. Both of my parents were born in Eastern Europe. One in what is now Moldova, my father, and my mother was born in what is now Belarus. And unlike so many immigrants to the United States, they never bothered to learn the language very well, couldn't read or write, either one, until the day they died. I always had my report cards at Public School 33 signed by my brother, because my father could sign his name, but you weren't quite sure that was his name if you looked at it. So here I was, born in what was then the East Bronx in 1930, and am aware, right from the start, as soon as I'm old enough to have any sense of what's around me, that we have been left behind by the people who have come from the same part of the world that my parents have, but who have quickly assimilated, became citizens. My parents didn't become citizens for years and… years but yet, for them, this was the golden land, nevertheless. They still had the sense that this is where they wanted to be, this is where they had all of the freedoms that they had dreamed of in those little villages. It's an old story. Millions and… millions of people have been in this situation, and so when they arrived, they had had a very difficult time, because there were a number of deaths in the family among those who arrived with them. By the time I was born, I had lost two uncles and a grandfather to tuberculosis. I had lost two aunts, one to puerperal fever, and one to probably tuberculosis. And as I grew up, other people died. My mother had had one stillborn child, she had a little boy that she adored who was born about five years before I was. That boy died of probably the croup or diphtheria at age three. I've visited his grave. He died in 1927. And that grave is in a very large graveyard of children's tombstones, because, of course, childhood mortality was very high. Any infectious disease could carry off a child. So, my brother was born and then I came along. My brother was born, actually, within a year of this boy's dying, and three and-a-half years later, I came along. And we were the family's link to the outside world. When we finally got into grammar school and learned how to read, we would translate, transliterate things. My parents could read Yiddish. They could read Yiddish very well and even write Yiddish reasonably well, but their conversation was in Yiddish. My grandmother, an ancient lady who, before she died much later, lost seven of her eight children, some in Europe, some here. And she spoke no English at all, so we spoke Yiddish to my grandmother, largely Yiddish to my parents, and English to the other fellow, the brother. 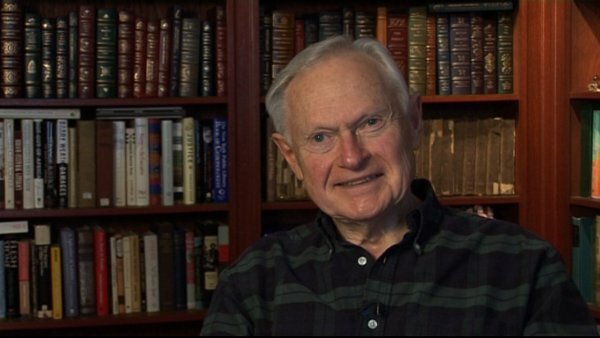 Sherwin Nuland (1930-2014) was an American surgeon and author who taught bioethics, the history of medicine, and medicine at the Yale University School of Medicine. He wrote the book How We Die which made The New York Times bestseller list and won the National Book Award. He also wrote about his own painful coming of age as a son of immigrants in Lost in America: A Journey with My Father. He used to write for The New Yorker, The New York Times, Time, and the New York Review of Books.